Numerical models need to include dust in order to avoid large radiative and associated dynamical errors as these are the only tools we have to predict future weather and climate. The simulation of the dust cycle depends on a wide range of earth system components but begins with realistic representation of source areas. However, there has been a notable absence of any real source area observations at model grid-box resolution in previous studies. To address this, the DO4 project undertook comprehensive fieldwork in three locations: the Makgadikgadi Pan, Botswana,the dry valleys of the Namibian west coast and Etosha pan in the north of Namibia. 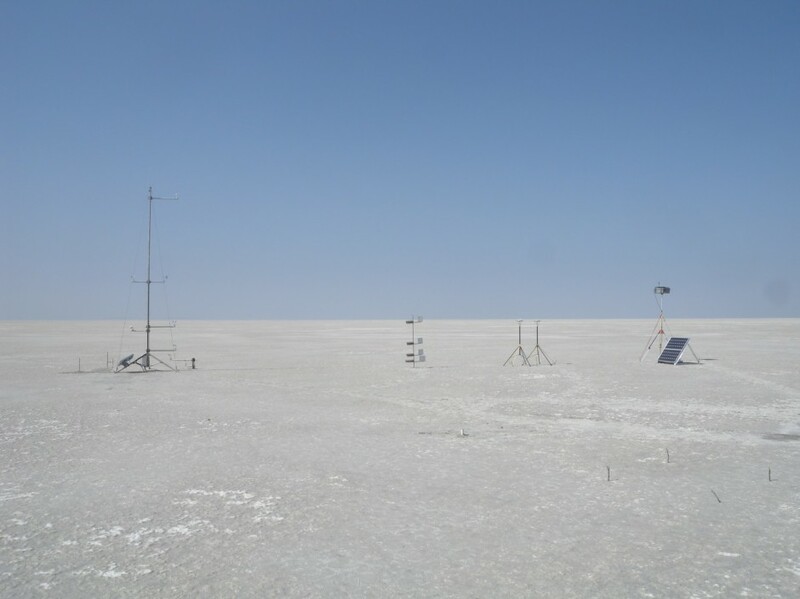 In Botswana, a 12 km by 12 km area of the Makgadikgadi Pan was instrumented with 11 meteorological stations consisting of anemometers, sediment transport traps and detectors, high-frequency dust monitors, soil moisture meters, net radiometers, shallow well networks, and photometers. A remarkable spatial and temporal variation in erodibility across the field site was recorded over the 90 day monitoring period. The dust emission observations are being used to evaluate model dust emission parameterisations and published results show that emission schemes overestimate the horizontal dust flux by several orders of magnitude. The main reason for the substantial discrepancy is the surface crusting which limits the availability of erosive material, even at higher wind speeds. Automatic weather stations set up on the Makgadikgadi Pan, Botswana, in 2011 (Credit: F. Eckardt). In Namibia, three dry valleys along the west coast were instrumented: along the Huab River valley in the Skeleton Coast National Park, another along the Kuiseb River that drains through Walvis Bay, and the last set along the Tsauchab River that ends in the Namib Sand Sea. Between April and September these dry valleys frequently emit dust under the influence of the berg winds, which transport the dust offshore. Although these dust plumes are large enough to be seen in satellite imagery, they are small enough for the emission sources to be pinpointed, which enables the dust emission mechanisms to be studied in detail in situ. In 2015 the project moved to the southern hemisphere’s largest dust emission source at Etosha pan in northern Namibia. For an account of the fieldwork read James King’s blog on the European Geosciences Union website. The project website is here. There’s also a timelapse video showing the set up of the field sites in Botswana. DO4 Models collaborators with Oxford are the University of Sheffield, Imperial College London, the University of Southampton, the Met Office and the University of Cape Town. The project is funded by the Natural Environment Research Council and the University of Oxford Fell Fund. Nield, J. M., J. King, B. Jacobs (2014), Detecting surface moisture in aeolian environments using terrestrial laser scanning, Aeolian Research, 12, 9-17. Nield, J. M., J. King, G.F.S. Wiggs, J. Leyland, R.G. Bryant, R.C. Chiverrell, S.E. Darby, F.D. Eckardt, D.S.G. Thomas, L.H. Vircavs, R. Washington (2013), Estimating aerodynamic roughness over complex surface terrain, Journal of Geophysical Research Atmos., 118, 12,948–12,961.